Thank You for joining us at the 2019 17th annual KiteXPO!!! Amazing wind Friday, an incredible Mediterranean dinner and Bonfire Saturday and huge drawings on Sunday!!! Check back in for 2020 details, coming soon! A perfect "about our event" video! Check it out here. Logan Castro, JJ Jackson and Taizen ThomasWong playing a composition by Taizen at the bonfire during the 2019 17th annual XBA KiteXPO!!! Check out Pismo kite expo 2018 from the sky! Participant Cost: 2019 registration cost $20 pp. This allows you to demo, access the downwinder van and receive two tickets towards the drawings on Friday and Sunday. Kite Demo: Friday and Saturday from 11:30am to 5pm, Sunday from noon to 2pm. Registration opens at 10am. To participate you must be an intermediate level or better kiteboarder/surfer/SUPer, comfortable in crowds, able to do basic tricks/self rescue, sign waiver and provide CC info (VISA/MC only) to demo kiteboarding and/or SUP gear. When you register you will receive: Two plastic cards with participating vendor logos on it. These cards will allow you to borrow gear from the vendors and have a chance to win (vendors will sign off when you visit, turn the card in Sunday by 10am for a chance to win). A raffle ticket to win amazing swag thanks to our vendors! Local kite rules: Our beach does have local rules you should be aware of. We will have this posted and are happy to answer any and all questions at the event. Due to snowy plovers and other beach traffic we are limited from March 1st - September 30. State Parks will ticket you for non-compliance and it hurts local kiters the rest of the year, so please read up and respect! Official rules are linked here. Come play in our waves without worrying about getting back upwind. We will pick you up in a 15 passenger van before the Pier Avenue onramp/bathrooms. This service is included in your $20 registration fee! Being a new service for us, please be patient as we workout the hiccups. Come and hang out with us to help raise funds for The Oceano Junior Lifeguard Association. Your stoke to enjoy a good meal with great company will help local kids learn to love, respect and find a career path on our beach through scholarships. This year we will be enjoying a Mediterranean meal from Jaffa Cafe! Come build your own gyro stuffed full of chicken shawarma, gyros meat (beef and Lamb combo), rice, grilled veggies, hummus, stuffed grape leaves, fatoush garden salad, pitas, and all sauces that they offer in the restaurant. For dessert, baklava. Enjoy an 805 from Firestone Brewery with your meal. Cheers to our amazing local companies who are helping us support future waterman!!! Tickets are first come first serve and available to purchase at registration. After, join us on the beach for a big bonfire and enjoy the company! Enjoy live acoustic music with JJ Jackson and Logan Castro. They have a very special guest joining them, Taizen ThomasWong!!! Taizen (Kinsley and my son) has a passion and drive for music that rivals his dad’s in kiteboarding! Join us to enjoy and support him as he shares his love with you! To celebrate Kinsley’s birthday, help us toast to another incredible year of spreading his stoke! Setup your kite season with swag from our vendors! Use one of your two tickets from registration for an opportunity to win. As always our vendors have donated an incredible amount of swag and we love to give it away! Saturday 5:30pm: A Game of Chance!!! 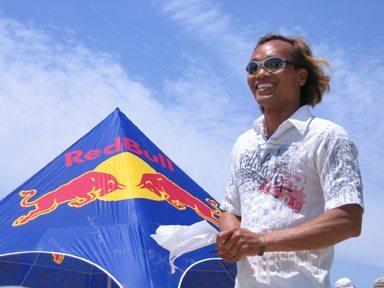 How well do you know your kite knowledge?!?! New this year, you can purchase an opportunity for a Game of Chance @ $10 per chance. If you answer our kite-related question correctly, you will get a ticket good for a drawing before the Saturday night dinner. Sunday 10am: Two Chances to win!! Your second ticket from registration will be entered for the first drawing! Turn in your vendor card Saturday evening or Sunday morning for another opportunity to win big! A huge thanks to the companies below for donating their products for the drawings. OLA is an amazing local organization that is helping to train our next generation of watermen. They provide scholarhips to kids that couldn't afford to attend the junior lifeguard program. This not only provides an incredible education in our ocean and life skills that come with it; but also a career path into lifeguarding and state park ranger for those that keep with it. While at the event they will be helping us to keep you all safe, fed (BBQ time Saturday night), and helping everything run smoothly. We are hoping this year to help them increase their presence and have a family friendly get to know your lifeguards day to learn more about this incredible group. More details to follow. Learn more about them on their site linked here. OLA in the News! Check out this article from our local Santa Maria Times Newspaper. Cheers to our sponsors who are helping make this years KiteXPO the best yet! Check them out and show your appreciation for their community support!! We are stoked to have our event powered by Patagonia! An incredible brand, CA local and all about the outdoors we are all stoked to enjoy to the max. Thank you Luv2Camp for providing us a registration trailer for the event! Want to make your XPO experience even better and easier? You rent it, they deliver it! RV Camping Trailer Rentals Delivered and Setup at your Campsite! Community supporting community! Thank you Ali and Wendy of Jaffa Cafe, without your support with our Mediterranean dinner our fundraising for OLA would not be a success. Incredible Mediterranean cuisine using the freshest ingredients at two locations. A must to visit everytime you come enjoy the Central Coast! Cheers to an amazing local brewery with a mission to support community! We are stoked to enjoy 805 as we raise funds to provide scholarships for the Oceano Lifeguard Association. I cannot think of a better way to enjoy an amazing meal after a day of kiting on the beach than a cold 805! Thank You Susan for understanding our event and helping us with the coverage needed to make it happen! It is impossible to hold an event without the right insurance. A behind the scene need, but one that allows us to all kite and play together at XPO. Very few agencies specialize and understand an industry as unique and xtreme as ours.